Dr. Ernie Ward delves into his top dental questions when it comes to cats. For more from Dr. Ward, find him on Facebook! I think in general cat guardians have less direct interaction with their cat’s mouths (i.e. not as much kissing or licking. Cats are far too dignified for that.). Cat guardians have less direct contact with their pet’s mouth through chew toys and bouts of tug-of-war (as if a cat could be bothered). The fact that poking around a cat’s mouth often results in deep puncture wounds (well…duh). Take your pick, add your own, but the majority of cat owners I serve seem largely uninterested in the teeth, gums, lips, and tongue of their feline friend. But when they do ask questions, they’re some of the best, most challenging and interesting inquiries you’ll encounter. Read on; you just may learn something or get a chuckle or two. 1. 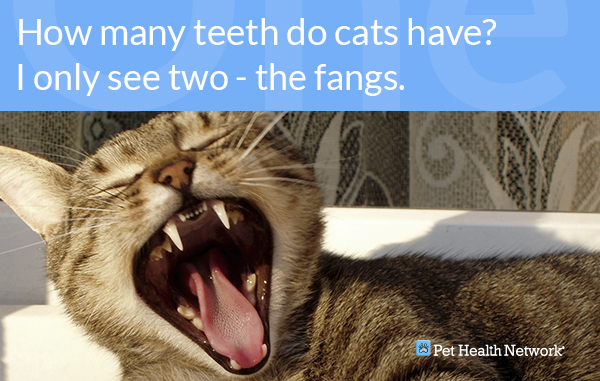 How many teeth do cats have? I only see two – the fangs. Cats have 30 adult teeth and 26 baby teeth. That’s far fewer than dogs (42 and 28) and less than humans (32 and 20). Those “fangs” or upper canine teeth often protrude saber-tooth tiger style and lend some cats an intimidating smile. Yes, I’m afraid. And I think those enamel-embellished kitties prefer it that way. 2. 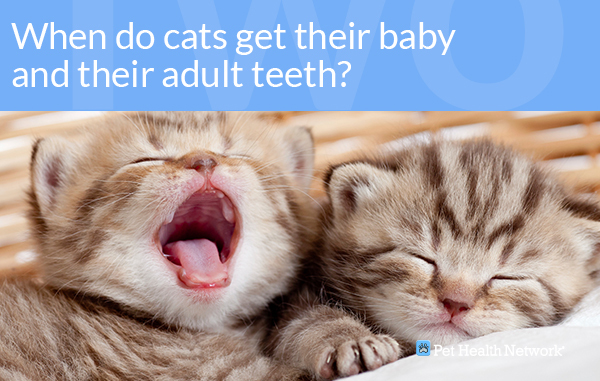 When do cats get their baby and adult teeth? Observing the eruption or emergence of teeth is a great method for estimating a kitten’s age. This is particularly helpful when faced with a stray kitten. The first teeth to erupt are the tiny front teeth or incisors and the long, pointy canines (some people still refer to them as “fangs.” Blame it on Twilight.). The primary (or “baby”) incisors and canines become visible around three to four weeks of age. The teeth immediately behind the canines, the premolars, quickly follow the front teeth. This typically occurs when the kittens are around five to six weeks old. The permanent teeth erupt around 11 to 16 weeks of age, beginning with the incisors followed by the canines at 12 to 20 weeks. The premolars are in place by 16 to 20 weeks of age. The difficult-to-see, way-in-the-back molars emerge around 20 to 24 weeks. 3. 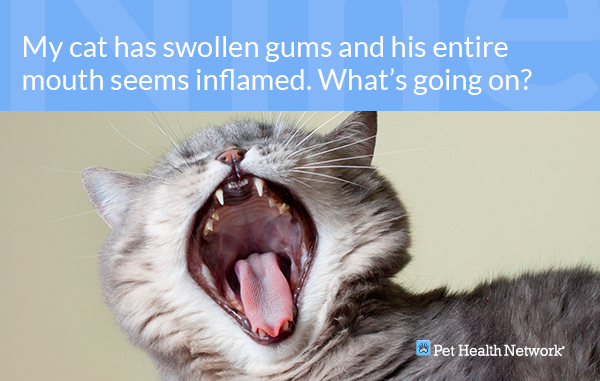 Do cats get cavities? 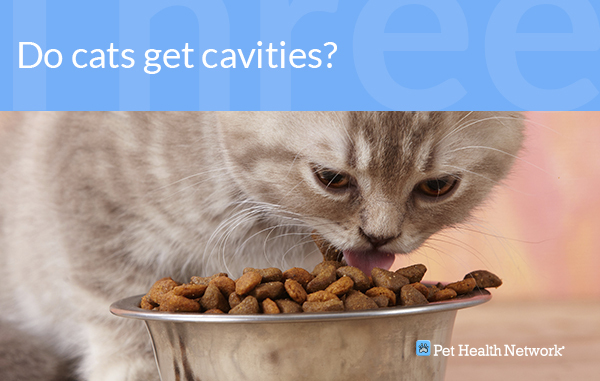 Dental caries, or “cavities” for the rest of us not calling ourselves “Dentist,” are rare in cats and dogs. 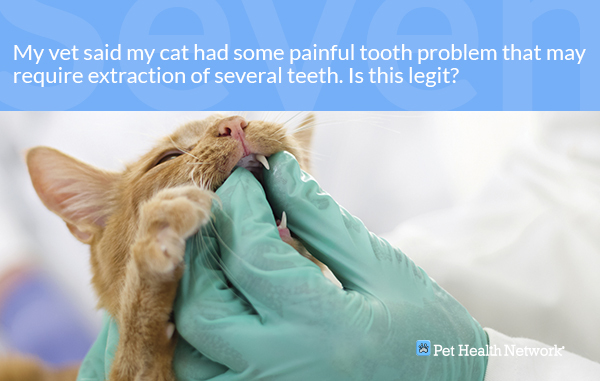 This is due in part to a cat’s relatively low-sugar diet, differences in oral bacteria, and the shape of the teeth. When cavities occur, they can be painful and require similar repair procedures as humans with cavities, or, dental caries. 4. Why are cat bites so bad and likely to get infected? Anyone who’s worked with and handled enough cats knows that when you’re bitten (note I said “when”) by a cat, not only does it hurt like you-know-what but those deep puncture wounds are likely to become infected or abscessed. The first answer lies within the unique anatomy of one of a cat’s main weapons – those long, sharp, pointy canines. Designed similar to hypodermic needles, these teeth excel at penetrating flesh intensely, damaging underlying structures such as arteries and veins. In addition, like that needle, they carry pathogenic bacteria deep inside the body. As the tooth is withdrawn, the narrow puncture wound closes onto itself, trapping behind infection that later becomes an abscess. Making matters worse, a cat’s mouth contains several species of highly pathogenic microorganisms. This is why whenever a cat bites one of my veterinary staff, I send them to the physician’s office immediately to begin a course of antibiotics. I have a friend whose wife was recently bitten by a stray cat they were attempting to rescue. She was bitten but thought it was such a tiny bite that it would be fine. She almost lost her hand. After intensive intravenous antibiotics and a couple of days in the hospital, I’m happy to report she’ll keep her hand, although she may have permanent impairment. Don’t take a chance if you’re bitten. Flush the wound thoroughly and seek medical attention. 5. 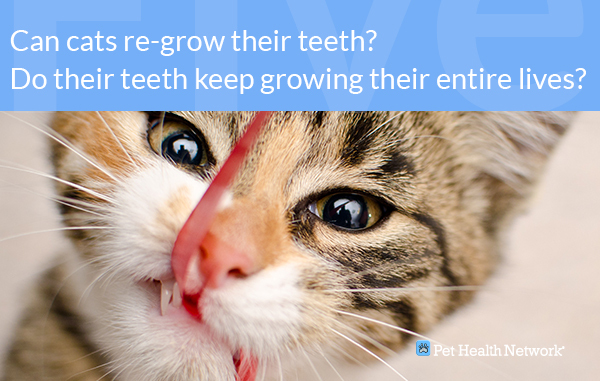 Can cats re-grow their teeth? Do their teeth keep growing their entire lives? 6. 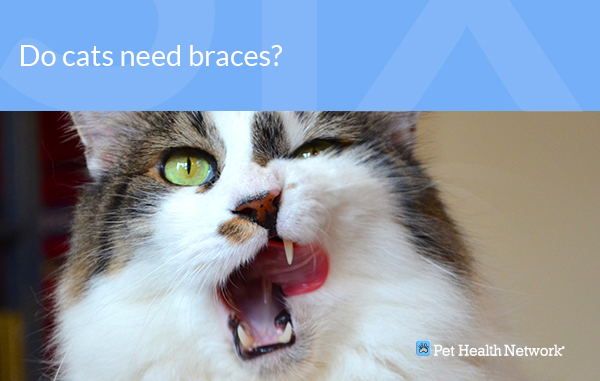 Do cats need braces? You jest but some cats do, in fact, need braces to correct some very severe oral malformations. The most common reasons for feline brace-face include lance or saber-like canine projections of the upper canines in Persian cats. “Wry bite” is another problem that results when an uneven bite occurs, causing one or both canines to protrude at odd angles, preventing normal eating and drinking. Braces for cats aren’t for cosmetic but literally life-saving conditions. 7. My vet said my cat had some painful tooth problem that may require extraction of several teeth. Is this legit? I’m guessing your cat may be one of the millions of cats affected by an unusual, exceptionally common and extremely painful condition known most often as feline ondoclastic resorptive lesions, or FORLs. Most cats with FORLs are over five years old. The most common clinical signs associated with FORLs include excessive salivation, bleeding from the gum line or teeth, and difficulty eating. Many of my patients will suddenly become “picky” and refuse to eat dry kibble. There are many treatments available, but extraction is still the most commonly performed procedure to relieve this excruciating condition. The exact cause of FORLs has yet to be determined, although researchers are actively pursuing several theories. 8. 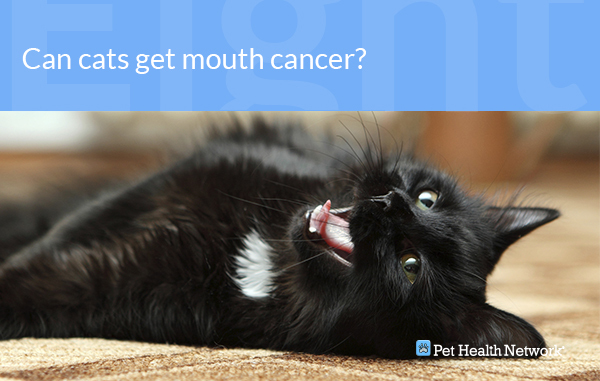 Can cats get mouth cancer? Sadly, yes. Oral tumors in cats are very serious and require immediate and aggressive treatment. Squamous cell carcinomas (SCC) are the most common malignant oral tumor in cats, although many other forms of cancer occur. If you observe any lumps, swelling, or discolored areas in your cats’ mouth, have it seen by your veterinarian at once. 9. My cat has swollen gums and his entire mouth seems inflamed. What’s going on? My biggest concern is your cat has a condition called stomatitis (more correctly referred to as lymphocytic plasmacytic gingivitis pharangitis syndrome). This condition is also very painful and most cats have problems eating and swallowing, weight loss, and excessive salivation. Treatments vary widely and cats respond differently to an assortment of options. The exact cause is unknown although an underlying immune-mediated disorder is strongly suspected. Be patient and work closely with your veterinarian; cats with stomatitis require extended periods of treatment. 10. 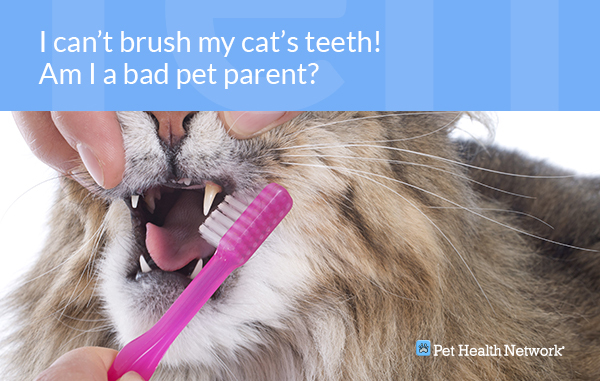 I can’t brush my cat’s teeth! Am I a bad pet parent? If not brushing your cat’s teeth is your worst offense, I’m not going to say you’re a bad kitty momma. Besides, I’ll let you in on a secret; I don’t brush my cats’ teeth, either. Instead, I have their teeth regularly cleaned (typically at least once a year) under anesthesia by one of my veterinary technicians. While my kitties are sleeping, I take dental x-rays to ensure there are no hidden problems underneath the gums. I also give them chew treats approved by the Veterinary Oral Health Council (VOHC) to help reduce tartar in cats. My cats will tolerate oral antimicrobial rinses so they get their “mouth wash” a few times each week. Finally, I make it a habit to (carefully) lift the lips of my cats and examine their teeth and gums each week to make sure everything looks healthy. So don’t fret; take your cats to your veterinarian at least once a year, have the teeth cleaned by a professional when needed, conduct routine home mouth checks, and use products proven to help keep your kitty’s mouth healthy.